These PinoyInvestor sections are primarily based on Technical Analysis and, as such, may only be relevant to short-term traders. 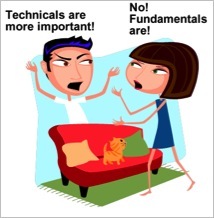 (Learn more about Technical Analysis in the PinoyInvestor Academy.) Check out each section below for more details on how you can use PinoyInvestor to succeed as a short-term trader! Long-term investors may also consider these sections but should remember that these information are primarily short-term in nature and may not necessarily impact their long-term investing strategy. 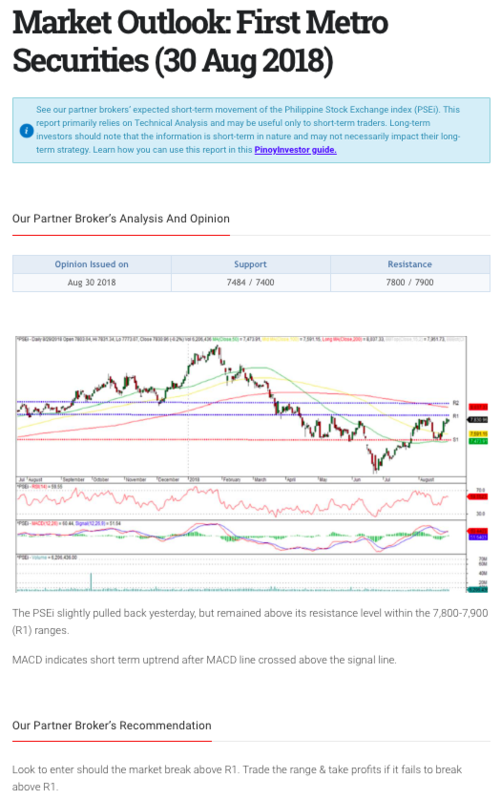 The Technicals Talk section summarizes our partner brokers’ technical analysis – including support, resistances, patterns, etc. – of select PSE stocks. Technical Analysis relies on trends and price movements and is typically used for short-term trading. Again, if you’re a purely long-term investor, take note: You should not be even looking at the Technicals Talk section. As we have always explicitly stated, this section is only for people with a short-term trading orientation (i.e., daily or weekly trading activity) and it obviously does not coincide with long-term investing objectives! Here’s an example of one of our Technicals Talk reports. 1. 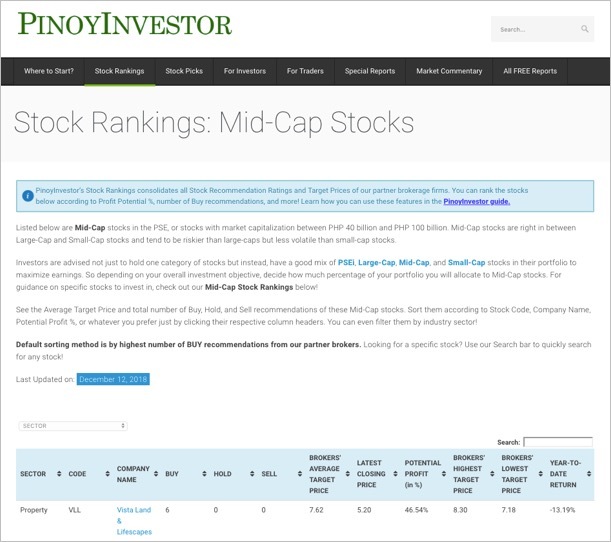 Mid-Cap Stock Rankings include stocks with market capitalization between PHP 40 billion and PHP 100 billion. Mid-Cap stocks are right in between Large-Cap and Small-Cap stocks and tend to be riskier than large-caps but less volatile than small-cap stocks. 2. Our Small-Cap Stock Rankings is comprised of stocks with market capitalization of less than PHP 40 billion. Small-Cap stocks could soon grow to become Mid-Cap or Large-Cap stocks, providing huge upsides in profit, but they are also more volatile and carry additional risk. If you’re willing to take in more risk in exchange for a possible huge price appreciation, Small-Cap stocks may be for you. Historically, this type of stocks outperforms Large-cap and Mid-Cap stocks during bullish market periods but, in recession, they also get beaten the most. 3. 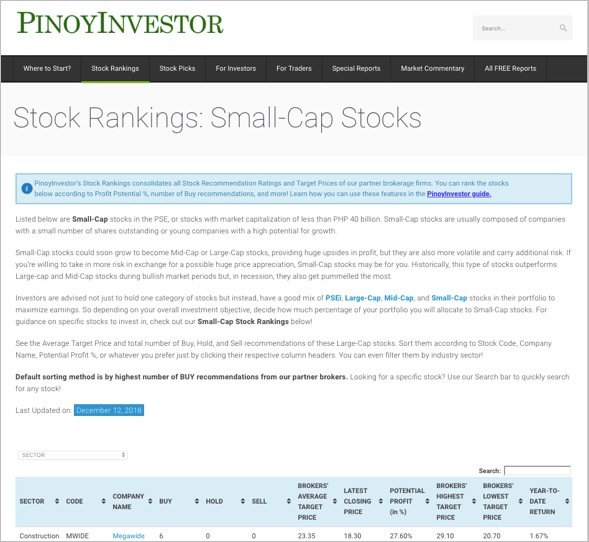 The Rankings of All Stocks list all stocks covered in PinoyInvestor (over 80++!) according to alphabetical Stock Code. 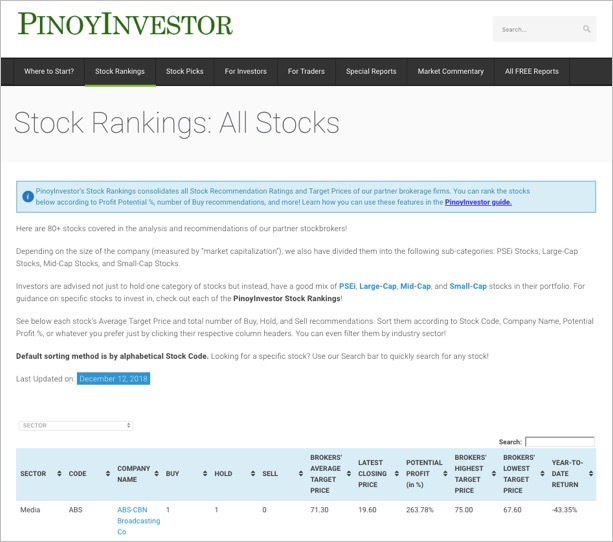 This is for those who want to see all of the Buy / Sell / Hold recommendations and Target Prices of all the stocks PinoyInvestor covers! REMINDER! Our PSE index (PSEi) Stock Rankings and Large-Cap Stock Rankings are usually intended for long-term investors. For more details how long-term investors can benefit from PinoyInvestor, head over to Using PinoyInvestor for Long-Term Investing. 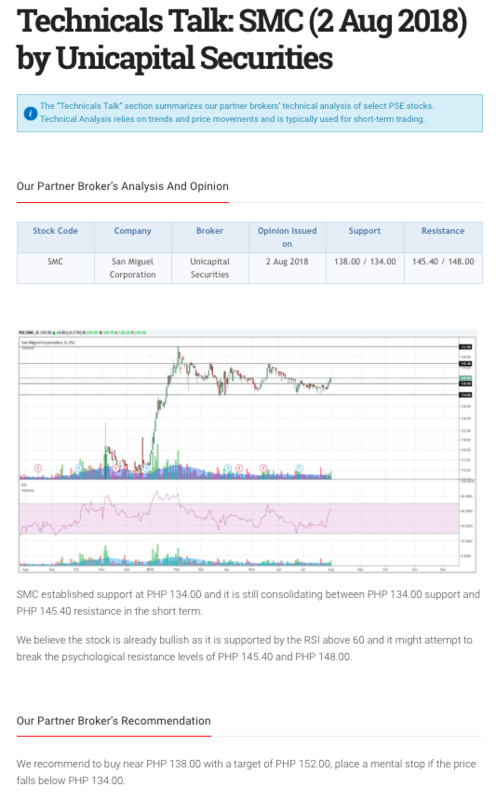 The Daily Market Outlook highlights our partner brokers’ Technical Analysis of the PSEi (showing its expected movement) for the coming days. Which Investment Strategy is the Best?